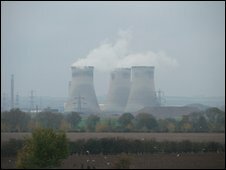 A student who took part in a three-day protest at Didcot Power Station in Oxfordshire has been found guilty of aggravated trespass. Oxford student Carl Van Tonder, 20, was among 20 protesters who broke into the power station in October 2009. He denied the charge but was convicted and handed an 18-month conditional discharge and ordered to pay £500 costs at Oxford Magistrates' Court. Nineteen others admitted aggravated trespass at an earlier hearing. Van Tonder, of Wellington Street, was among nine protesters who climbed a 650ft (198m) chimney stack after gaining entry to the power station early on 26 October for an environmental protest. The remaining 11 chained themselves to a coal conveyor belt. Van Tonder gave himself up after three days and was arrested by police waiting below. In court, he argued the threat to the environment of carbon dioxide emissions from the power station justified his part in the protest. But District Judge Tim Pattinson disagreed. Of the 19 people who pleaded guilty at the earlier hearing, 13 were given conditional discharges while four received community penalties of between 40 and 80 hours. All were told to pay costs. Two other men were fined £155 and one of them must also pay court costs.